Put some extra-ripe bananas to good use in these triple chocolate banana cupcakes. 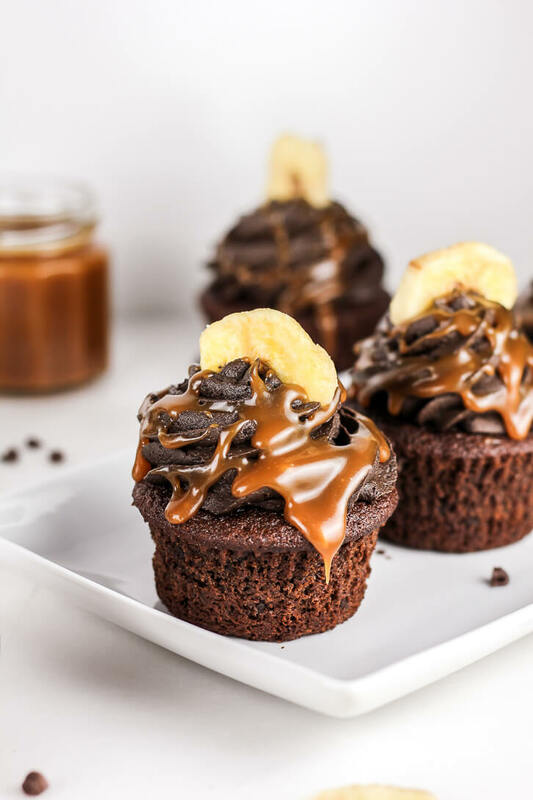 A dark chocolate buttercream frosting and homemade caramel sauce drizzle makes them an irresistible dessert! Whenever Ben and I visit his parents in Kansas City, my mother-in-law makes sure to buy a bunch of bananas before we get there. Somewhere along the way, she figured out that bananas are kind of their own separate food group when it comes to the Flour Covered Apron household. And in fact, they are always the very first item I add to our grocery list. Why so many bananas, you ask? Well, Ben and I each have one for breakfast every morning (whether in a smoothie, or oatmeal, or blended up for pancake batter), sometimes for a midday snack (with a big spoonful of peanut butter, of course! ), and I always like to have plenty on hand for baking! We typically keep a batch of yellow bananas for eating, a batch of very ripe bananas for baking, and another batch in our freezer (perfect for smoothies!) at all times. It takes some planning and a whole lot of patience, but I highly recommend waiting until your bananas are very, very ripe for baking. They should be dark brown – or even black – all over. This will make them easier to mash of course, but most importantly, it will give you an absolutely wonderful banana flavor in your baked goods. I have tried to speed “ripen” bananas in the oven before: it’s a hack circling around the internet where you bake a few bananas on a baking sheet at 300 degrees for 30+ minutes. I guess it’s fine if you have to have banana bread, like right now. But personally… I don’t think the flavor comes through near as much as it does when you have a truly ripe banana. And in case you were wondering, I once tried that oven-ripening hack on an avocado too and the results were very unimpressive. But to be fair, the avocado was literally rock hard when I started out. Anyway, once your bananas are indeed ripe, you need to make these triple chocolate banana cupcakes ASAP. I developed this recipe as kind of an ode to my dark chocolate and salted caramel banana layer cake. But this time, there’s extra chocolate in the mix! The banana cupcake batter incorporates cocoa powder and plenty of mini chocolate chips. And the dark chocolate buttercream is made with both dark cocoa powder and melted dark chocolate. It’s so decadent, I love it! And because chocolate, bananas, and caramel make a wonderful combination, I couldn’t help but drizzle homemade caramel sauce all over these beauties. I know, I know, making caramel sauce from scratch is a whole extra step. But trust me, it’s so worth it. Below, you’ll find my favorite caramel recipe, which involves heating the sugar until it melts completely into a beautifully amber-colored liquid, before adding butter and heavy cream. Once you master the process, I promise you’ll want to put caramel sauce on everything too! I recommend starting with these triple chocolate flourless brownies. Or, these dark chocolate thumbprint cookies! Put some extra-ripe bananas to good use in these triple chocolate banana cupcakes. A dark chocolate buttercream and homemade caramel sauce drizzle makes them an irresistible dessert! Preheat the oven to 375 degrees Fahrenheit and line a muffin tin with paper liners. This recipe makes about 16 cupcakes. In a medium bowl, whisk together the dry ingredients (flour, cocoa powder, espresso powder, baking powder, baking soda, and salt). In a large bowl, use an electric mixer to cream together the butter and both sugars until light and fluffy, about 3-4 minutes. With the mixer on low speed, add the vanilla, then the eggs one at a time. Beat until incorporated. On low speed again, add the mashed banana. Then, gradually add the flour mixture, mixing after each addition. Finally, add the buttermilk and beat on medium speed until just incorporated. Using a wooden spoon or spatula, fold in the chocolate chips. Divide the batter evenly among the muffin tins, filling each one about 2/3 of the way full. Bake at 375 degrees for 10 minutes, then reduce the heat to 350 degrees and bake for another 5-7 minutes. Check for doneness with a toothpick, it should come out with a few moist crumbs attached. Let the cupcakes cool in tins for about 5 minutes, then transfer to a wire rack to cool completely. Using an electric mixer, beat the butter until creamy. Add the cooled, melted chocolate and beat until combined. With the mixer on low speed, gradually add the cocoa powder, then the powdered sugar, mixing to incorporate after each addition. Add the vanilla extract, then add the heavy cream one tablespoon at a time until desired consistency is reached. Frost cupcakes as desired. Over medium heat, melt the sugar in a medium saucepan. Stir frequently with a wooden spoon until melted (it will begin to clump together then melt completely into an amber-colored liquid). Reduce heat to low and add butter (the sugar may bubble and splatter when the butter is added, this is okay). Continuing stirring until the butter is melted and incorporated with the melted sugar. While continuing to stir the mixture, slowly pour in the heavy cream (the mixture will bubble and splatter again). Mix until incorporated, then increase heat to medium again. Allow caramel to boil for another minute or so, stirring occasionally. Remove the caramel from the heat and stir in the vanilla extract and salt. Pour into a heatproof jar or bowl and let cool until no longer hot, but still fluid. Use a spoon to drizzle the caramel over the cupcakes. Top with banana chips!